The former Harvard professor made the announcement in a video emailed to supporters. In the four-minute video, Warren trumpeted a message of economic fairness. CNBC|AIWA! NO!|Sen. Elizabeth Warren delivered her first live pitch to presidential primary voters in Iowa on Friday night with a signature and searing indictment of the powerful interests she blames for corrupting government and decimating the American working class. The trip is an early test for the Massachusetts Democrat’s growing political operation, which unveiled a slate of touted hires this week, and a candidate determined to show that her populist economic message can conjure up excitement for her campaign in Iowa’s traditional proving grounds. During a question and answer session that followed her remarks, Warren was quizzed on where she thought the Democratic Party was headed in the run-up the 2020 election. After touting the public education — and government investment in the economy — that provided her a pathway to personal and professional successes, she boiled it down to a single issue. Warren’s travels will first track the state’s western border, taking her from Council Bluffs up to a Saturday event in Sioux City. Then it’s a dash east to Storm Lake before setting out for Des Moines. Warren will also convene a conversation with female leaders in nearby Ankeny on Sunday morning. The trip is her first here in more than four years — an aide confirmed that her last visit to Iowa came in October 2014 to campaign for former Rep. Bruce Braley when he ran, unsuccessfully, for Senate against Republican Joni Ernst. With the the launch of a presidential exploratory committee on Monday, she effectively kicked off the 2020 primary more than 13 months before caucusgoers in Iowa will begin casting their votes. By Friday, she was standing in front of 500 people, according to a staffer — 300 inside, 200 outside on a crisp western Iowa night — pitching herself, and her message, as the antidote to growing economic inequity and a faltering health care system. But she also faced at least one fraught question, from a former student who said she backed Warren’s bid but worried that her former professor’s support for abortion rights would sink her chances in the Midwest. Warren’s remarks, which were briefly rendered almost inaudible when her mic lost power, included a call to volunteer and back a campaign she has pledged will not accept corporate cash. That slate also now includes Obama’s former chief digital strategist, Joe Rospars, who had a lead role on both of the former president’s campaigns. Rospars will oversee Warren’s grass-roots mobilization, national operations and planning in the early states, according to two sources familiar with the staffing moves. Warren has also recruited Richard McDaniel, the former field and political director for Alabama Democratic Sen. Doug Jones and senior adviser to the young progressive Randall Woodfin’s mayoral campaign in Birmingham. Warren’s team will hope this opening week — Instagram live beer-slugging and tea-sipping included — begins to dim the spotlight on what many Democrats viewed as an ill-advised attempt last year to prove her claims to Native American ancestry with a DNA test. She made the results, which confirmed her earlier statements, public in a five-and-a-half minute video released nearly 12 weeks ago. But the process angered some tribal leaders and predictably failed to quiet President Donald Trump’s mocking attacks, which he ramped up in a Fox News interview and on Twitter after her announcement on Monday. Warren brushed off Trump’s comments when asked about them by reporters Thursday on Capitol Hill but responded to a Politico story, which explored soon after her announcement the notion that she might be unlikable, with a cheeky tweet and fundraising email. 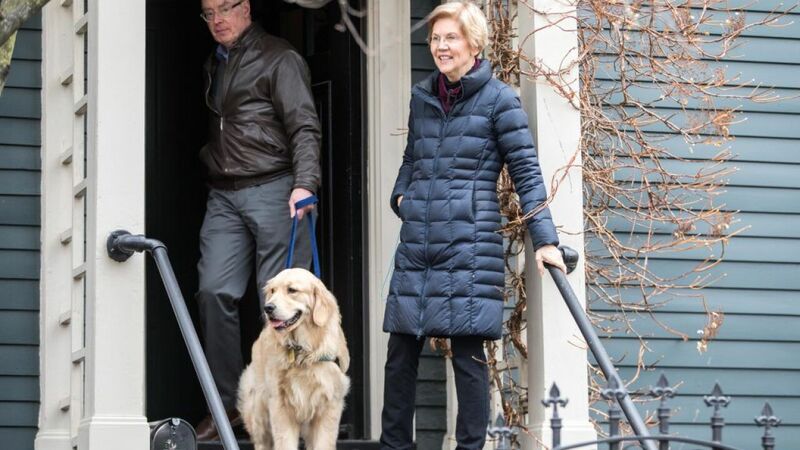 In an extended interviewWednesday with MSNBC, Warren warned against allowing super PACs and self-funding candidates to gain a foothold in the coming primary. The comments were an unmistakable shot across the gilded bows of billionaire potential candidates Michael Bloomberg, the former mayor of New York, and investor Tom Steyer. Both men spent heavily to back Democrats during the midterm elections and have flirted — not for the first time — with runs of their own. In a video announcing her decision to form an exploratory committee, Warren did what other Democrats have in the past shied away from — pointing specifically to the people, party and institutions she blames for hollowing out the American working class. She pledged to root out corruption in government and impose stricter regulations on Wall Street banks. “These aren’t ‘cracks’ that families are falling into; they are traps,” Warren said. “America’s middle class is under attack. How did we get here? Billionaires and big corporations decided they wanted more of the pie and they enlisted politicians to cut them a fatter slice.”Copyright 2019 Scripps Media, Inc. All rights reserved. This material may not be published, broadcast, rewritten, or redistributed.